Is the 2016 Optima is as good as the hype? I\\\'m considering the purchase of a 2016 Optima, though unsure at this point whether it will be EX, SX or SXL. I like the fun aspect of the the turbo and luxuary in the SXL and SX but was also fine with the EX on on my test drive. In revieing owner experience on this site, there seemed to be reliability issues in the 2014 model. How relaible has your Optima been and what advice would you offer? 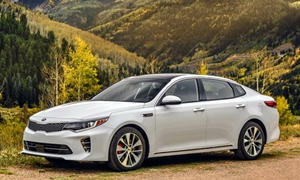 I\\\'d also be very interested in hearing comments from 2016 Optima owners. With about 35k I am still happy with my 2013 EX. I don't need the turbo. I own a 2016 LX Turbo. Love the car. Outstanding fuel milage and when you need the power, you have it. This is only one level up from the base, but I think you need to consider it because of its MPG. Not many bells and whistles but enough standard features to put many mid size sedans to shame. I owned a 2014 Camry LE Hybrid. Very nice car, but not nearly as nice as the Optima. Believe the hype. The 2016 Optima is top notch. Choose the model you want with the features you want and you will be happy. As for reliability, you can't get better. But even if you happen to get a stinker, the 5-year bumper to bumper and 10-year drive train warranty is the the best in the business. No one can touch that. Thanks 415 for your response. Yep, I found the 2016 EX to be a nice driving car on my test drive and makes the most sense from a price point. I alos like the fact that you can get it w/o a sunroof and nav, which retains the CD player since it has the (much) smaller display. 1. Rear seat tire noise can be quite high. This may be better in the new model. 2. Throttle response can be unpredictably slow. This is peculiar to the older hybrid design. The regular 2.4L engine is quite snappy. 3. Front seat comfort degrades with time. A long trip is very tough on the lower back. Again, this may be improved on higher trim levels, and/or on the newer model.